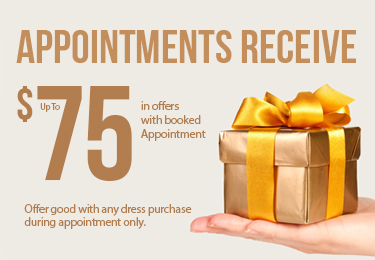 Need an appointment for more than one family member or friend? Multiple family members/friends must call 856-428-8181 to book, groups of 2 or more have to be scheduled by the store! *with dress purchase $75 credit includes $50 in free accessories of your choice, one free $20 garment bag and a $5 Starbucks, Wawa or Dunkin Donuts gift card with online review. At times appointments have to wait due to factors out of our control, we do our best to service every appointment in a timely manner.